Copa Airlines is the leading airline in Latin America for transporting passengers and cargo. The airline currently provides direct flights to more than 80 destinations in 33 countries throughout North America, Central America, South America and the Caribbean. 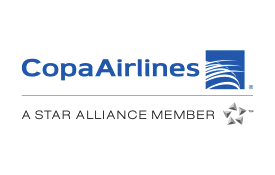 In the past 70 years of continuous operations, Copa Airlines has made the Hub of the Americas in Panama City the leading centre for connections in Latin America. Book nowBook now with Copa AirlinesOpens an external website in a new tab. Earn Skywards Miles when you fly with Copa Airlines and Copa Airlines Colombia. You can also spend your Miles for reward flights to more than 80 destinations in North, Central and South America, as well as the Caribbean. Spend your Skywards Miles on one-way and return reward flights with Copa Airlines and Copa Airlines Colombia. Reward bookings are available in both Economy Class and Business Class. Check the table below for how many Miles you will need for each destination. Please note that return flights require double the number of Miles. The following Copa Airlines sub-classes are not eligible to earn Skywards Miles: N, X, I, G, Z and P.
Codeshare flights operated by airlines other than Copa Airlines and Copa Airlines Colombia are not eligible to earn Skywards Miles. Miles cannot be earned on charter flights, test flights, Group Inclusive Tour (GIT), Inclusive Individual Fare (IIT), reward tickets, industry, agency discount tickets and free ticket promotions. Please quote your Emirates Skywards membership number when you book. If you don’t mention your membership number before your flight, you can request up to six months post-flight credit by sending your flight details to Emirates Skywards using the claim Miles form. You will not earn Tier Miles on your flight. Emirates Skywards members can spend Skywards Miles for Copa Airlines and Copa Airlines Colombia flights in Economy Class and Business Class. Reward tickets are not valid on codeshare flights operated by any other carrier other than Copa Airlines and Copa Airlines Colombia. Miles can only be redeemed for reward bookings on Copa Airlines and Copa Airlines Colombia in the following sub-classes: ‘X’ in Economy Class and ‘I’ in Business Class. Reward values are exclusive of taxes and other charges. These need to be paid separately. Reward travel may be restricted during blackout dates. Copa Airlines and Copa Airlines Colombia flights must be confirmed at the time of mileage redemption. Waitlists are not permitted. Children travelling on reward tickets will be required to spend the same amount of Miles as that of an adult. Infant rewards are not permitted. Refunds on partially utilised tickets are not permitted.